We have an exciting investment opportunity to announce today. Our team has been busy at work at a new condo project in Hamilton called the Dundurn Lofts and if you’re in the market for your next condo investment, this is one is pretty special. Tens of Thousands off Retail: This project is unlike anything we’ve seen in the Hamilton area and quality-wise, rivals some of the best we’ve seen across the local market. Our exclusive Condo Culture bulk deal on this project provides you with an opportunity to secure a unit before the upcoming public launch and save anywhere between $38,000 and $81,000 off the listed retail price depending on the unit size. Yes, you read that correctly. Our bulk deal incentives available before the public release are significant and provide investment value difficult to recreate at other projects throughout southern Ontario. Touch base with us by replying to this email or registering below and we’ll send you a full price list with the incentives summarized for each unit. (Very) Strong Rents: Units in the building achieve exceptional rents and are at or above luxury condo rental rates we are currently seeing in the Kitchener-Waterloo area. As an example, 1 Bedroom units in the building are achieving between $1550-$1850 and 2 bedroom units are achieving anywhere from $2000-$2700 per month. These rents are incredibly strong and make these units great investments with strong principal paydown each month. Don’t get us wrong, we love the long-term investment value of new projects in K-W but as we all know diversity is key and if you’re in the market, this opportunity represents a exceptional opportunity to diversify. Location, Location, Location: Hamilton is an exciting city to invest in these days but to us this opportunity really stands out and offers something none of the other new condo projects in Hamilton can provide. The obvious differentiator is the building’s location. The building is located steps to Hamilton’s revered Locke Street and within one of the most coveted neighbourhoods in the City. However, that being said, what really gets us excited about the opportunity as an investment is the lack of quality luxury condo rentals in the immediate area and density restrictions along Locke. We believe these factors combined with the unique architecture of the building will limit competitive supply to the market and provide units at the Dundurn Lofts with a longstanding competitive advantage. People absolutely love this location and it keeps getting better by the day. Young professionals, empty nesters and young families are all attracted to the the area and the many amenities it offers. The building is also walking distance to the future LRT stop, McMaster Innovation Park, McMaster University, public transit and has arguably the best access in the city to Highway 403 for commuters travelling to and from Toronto and the rest of the GTA. Amazing Common Spaces: The lobby and common elements in the building have just been completed and make this building one of the most attractive Hamilton has to offer. 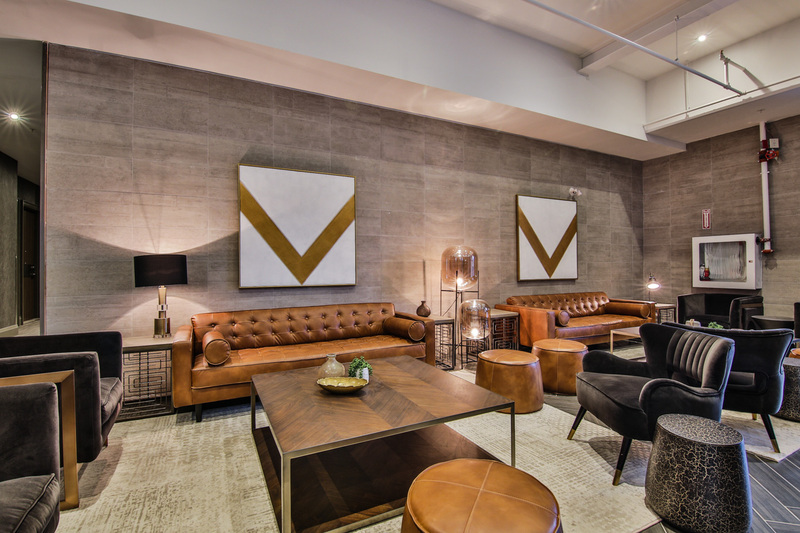 The finishes throughout the building have transformed the building and give it a feel that is more reminiscent of a high-end, luxury loft hotel than than your standard condominium. This makes us love the investment value at the project even more but if you think it looks nice in the video, wait until you check it out in person! Check out the video below and reply to this email to book a in-person tour of the building, available suites and location with a member of the Condo Culture investment team. Opportunity to Purchase Below Market: Hamilton’s condo market has experienced significant growth and strong appreciation. On a price per square foot basis, new condo projects in the city have been averaging anywhere between $580 and $700 per square foot. Units at the Dundurn Lofts being released prior to the public launch average below $500 per square foot when you consider all incentives resulting in significant savings when compared directly to units of similar size in other developments. 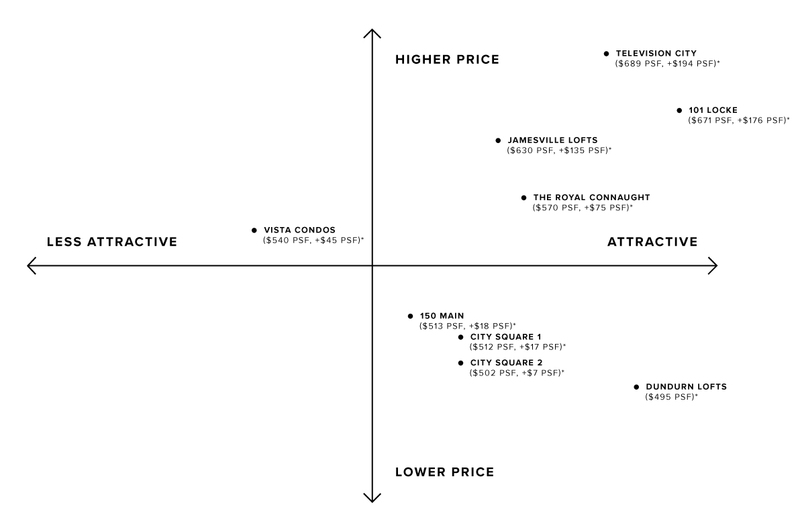 To draw additional context to the comparison and help emphasize why we feel so strong about the Dundurn Lofts as an investment, we created an easy to read chart that compares the average price per square foot of each new project in the area relative to the buildings overall attractiveness in the market. This chart helps show the Dundurn Lofts exceptional investment value as not only being one of the most attractive buildings and locations in the city but also at one of the most attractive prices as well. REGISTER NOW to receive a full price list and summary of all incentives.